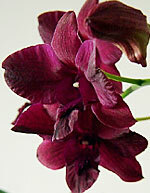 The Petite Syrah's cherry black hue lends a touch of drama to any space. Its sprays of blossoms exude a soft aroma of cinnamon that is very distinguishable in the afternoon. 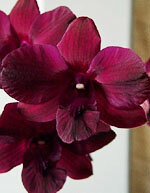 A remarkably hearty and low-maintenance orchid, once-a-week watering is enough for this Dendrobium. The plant stands approximately 2-3 feet tall and shipped with 7-12 buds. The blooms measure 2.5 inches in diameter. Sublimely simple, our classic Tang Style white porcelain cachepot is a perfect counterpoint in any potted orchid. 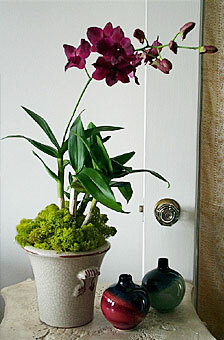 The 6" tall orchid pot is crafted individually in a modern style. View cachepot for details or choose below.